The University of Virginia was spared destruction by General George A. Custer and his Union troops during the occupation of Charlottesville and the University from March 3 to March 6, 1865. Minutes of a faculty meeting following the Union withdrawal report that the institution and its inhabitants fared better than anticipated and, “that very little damage was done to the University property during their sojourn here.”  However, the years of war took their toll on buildings, faculty, finances, and enrollment. 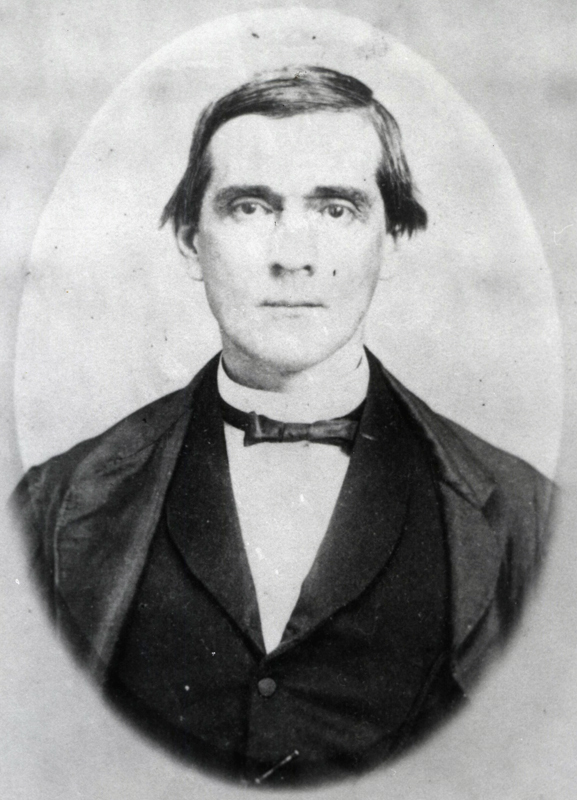 John Staige Davis, ca. 1866-1868. This photo was taken within a year or two of when he penned his letters to University officials. Prints10071, Special Collections, University of Virginia Library, Charlottesville, Va.
Sixteen months after the Army of Northern Virginia surrendered at Appomattox and in response to a Board of Visitors’ inquiry, Dr. John S. Davis wrote a letter to inform the University Rector of his department’s need for additional anatomical illustrations and fresh medical specimens. He pointed out that the war interrupted Henry Scharf’s painting of anatomical illustrations and that the medicines for the materia medica class were in such poor condition that he was forced to borrow specimens from a local druggist. The suite of paintings executed for my school by Mr.
country or abroad is similarly enriched. The Catalogue continues, “The Department furnishes every facility for the study of practical Anatomy that can be furnished in similar institutions elsewhere. Adequate provision is made for the supply of subjects, and each student has the opportunity, by actual dissections under the guidance of the Demonstrator of Anatomy, of acquiring a practical knowledge of the structure of the human body in all its parts.”  Fifteen years after this glowing report in the Catalogue, the department would suffer a calamity. 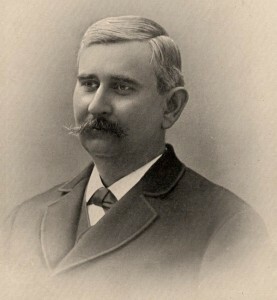 William B. Towles, 1880-1881. Dr. Towles graduated from the U.Va. medical school in 1869 and returned three years later as demonstrator of anatomy. 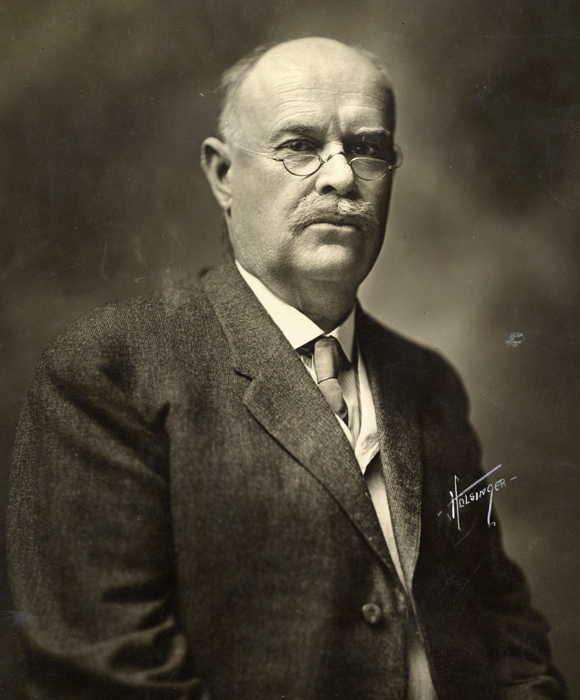 He succeeded Dr. John Staige Davis in 1885 and served until his death in 1939. Prints08141, Special Collections, University of Virginia Library, Charlottesville, Va.
Dr. Towles was in charge of plans for rebuilding and worked to renovate the Theatre “in a manner to insure the greatest comfort and convenience.”  Construction did not proceed quickly enough to open in spring 1887 as predicted, but by fall, the Theatre, minus the cupola and the railing of the previous structure, was ready for new classes. 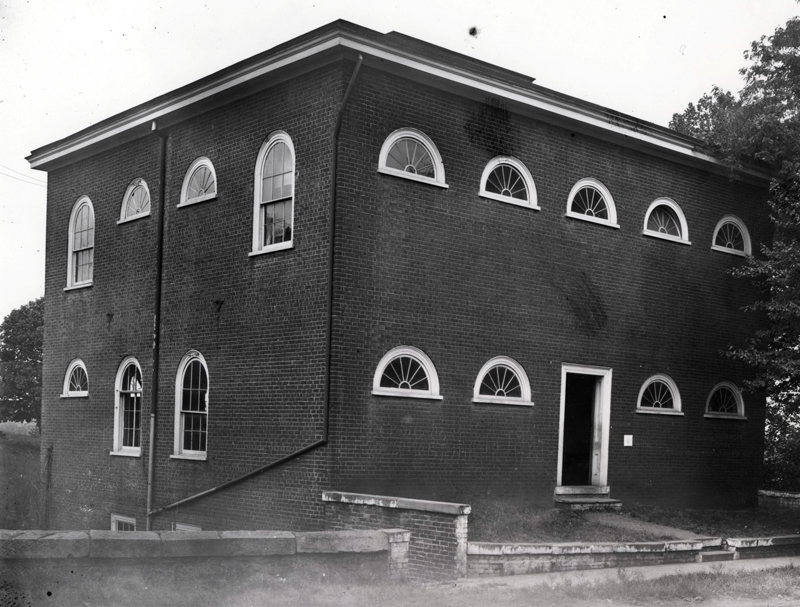 The inaugural day of October 25, 1887, occurred less than a year after the fire, and more than a hundred people attended the formal opening in spite of the inclement weather of rain, sleet, and snow. Paul Brandon Barringer, undated. Prints05979, Special Collections, University of Virginia Library, Charlottesville, Va.
Anatomical Theatre, post 1886. This photo shows the Theater as rebuilt in 1887 after the fire a year earlier. The railing and cupola were not replaced. Prints07392, Special Collections, University of Virginia Library, Charlottesville, Va.
Anatomical Theatre, ca. 1901? 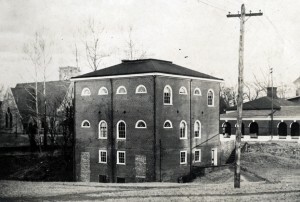 This photograph from the turn of the century shows the left side and back of the Theatre. Note the bricked up door to the charnel in the back right and the bricked up area to the back left that eliminated two windows. University of Virginia Photographs, 1901?, RG-30/1/3.093, Special Collections, University of Virginia Library, Charlottesville, Va.
J.S. Davis to J.E. Johnson, October 7, 1867. Papers of John Staige Davis, 1840-1888, Box 3: Letterpress book, 416. MSS 1912, 2842, Special Collections, University of Virginia Library, Charlottesville, Va.
University of Virginia, Faculty. Minutes, March 6, 1865, transcription, Encyclopedia Virginia. Retrieved from http://www.encyclopediavirginia.org/University_of_Virginia_Faculty_Minutes_March_6_1865. J.S. Davis to the Rector of the Board of Visitors. Papers of John Staige Davis, 1840-1888, Box 3: Letterpress book, 358. MSS 1912, 2842, Special Collections, University of Virginia Library, Charlottesville, Va. List of specimens wanted to complete a Cabinet of Materia Medica. Papers of John Staige Davis, 1840-1888, Box 3: Letterpress book, 447. MSS 1912, 2842, Special Collections, University of Virginia Library, Charlottesville, Va.
University of Virginia. Catalogue of the Officers and Students of the University of Virginia, Forty-eighth Session, 1871-72. Charlottesville: , 47. University of Virginia. Catalogue of the Officers and Students of the University of Virginia, Forty-eighth Session, 1871-72, 47. “Editorial: The University of Virginia.” Virginia Medical Monthly 13:10 (January 1887): 755. Retrieved from HathiTrust Digital Library. Barringer, Paul B. “Opening of the Anatomy Hall at the University of Virginia, with an Address by Dr. Paul B. Barringer, of Davidson College, N.C.” North Carolina Medical Journal 120:5 (November 1887): 277. 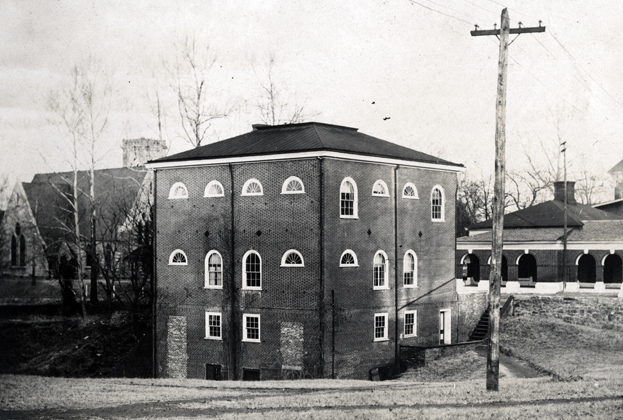 “Editorial: The University of Virginia.” Virginia Medical Monthly, 755-756. University of Virginia, Board of Visitors. Minutes, January 10, 1888, 98. Retrieved from http://guides.lib.virginia.edu/bovminutes. The minutes state that Barringer’s address was in the Virginia Medical Journal. It was actually in the Virginia Medical Monthly. The North Carolina Medical Journal, published two months earlier, contained not only Barringer’s text but also explained that the inauguration of the rebuilt Theatre was the reason for the address. This information was not printed in the Virginia Medical Monthly. University of Virginia, Board of Visitors. Minutes, June 25, 1888, 109. University of Virginia, Board of Visitors. Minutes, January 10, 1888, 100. University of Virginia, Board of Visitors. Minutes, June 27, 1887, 68. Fitz-Hugh, G. Slaughter. Anatomical Laboratory – Dissecting Hall 1833-1928, [manuscript], 1981, 3. Historical Collections & Services, Claude Moore Health Sciences Library, University of Virginia. University of Virginia, Board of Visitors. Minutes, December 5, 1893, 351-352. University of Virginia, Board of Visitors. Minutes, December 5, 1893, 352. University of Virginia, Board of Visitors. Minutes, December 5, 1893, 353. University of Virginia, Board of Visitors. Minutes, December 5, 1893, 353-355.